"Sampath Speaking" - the thoughts of an Insurer from Thiruvallikkeni: WC T20 2016 - India starts with a bang ! The ides of March was cruel to Julius Caesar ~ it was the last day for paying advance tax … ~ and the T20 WC began !! The pressure of playing at home, seeing themselves on billboards, and trying to live up to the hype around them for the first time at a global event should have been draining enough to put India in a cocoon. But the team responded well and intimidated the opposition, something that hasn't always been associated with India. The expression of confidence and authority is to do with their batting transformation, particularly upfront. The Powerplay witnessed even the composed Raj deviate from her natural game as she tried to hit her way out. And more often than not, it's the first six overs that have sealed India's fate, whether they have been batting first or chasing. At Chinnasamy Stadium, it was the women power. India Women 163 for 5 (Raj 42, Harmanpreet 40) beat Bangladesh Women 91 for 5 (Sultana 27*, Patil 2-16, Poonam 2-17) by 72 runs. India Women had played more T20Is in the last three months than Bangladesh Women had managed to play across formats since their World T20 debut in 2014. The end result was a lopsided contest as Bangladesh's lack of experience on the big stage stood brutally exposed. A target of 164 became a gap too far to bridge as India won by 72 runs to get their campaign off to an emphatic start. 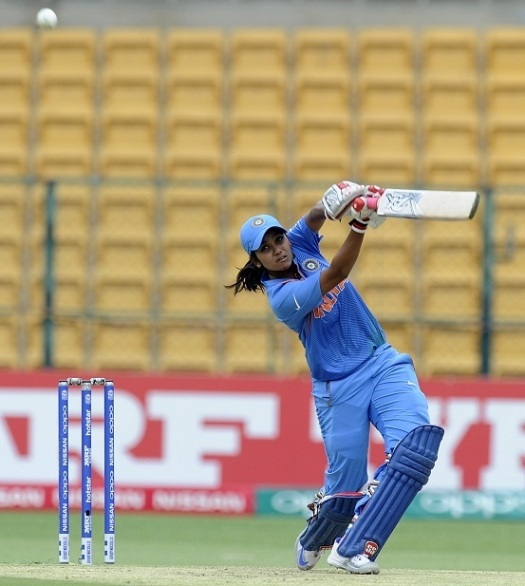 Mithali Raj and Vellaswamy Vanitha [above] did the early running, Harmanpreet Kaur gave impetus in the middle, while Veda Krishnamurthy sustained the surge at the death. Where Raj was all grace and timing, her younger colleague Vanitha was pure muscle. The first summer downpour descended on Bangalore soon after India Women wrapped up a comprehensive win over Bangladesh Women. Mithali Raj looked up to the heavens and closed her eyes, soaking in the cool air and smell of rain. Then she had a hearty laugh with her team-mates, posed for the pictures and the selfie. Chris Gayle is a great batsman in IPL and many other leagues. With eight squad members over the age of 30, West Indies are longer in the tooth and in many cases facing the final curtain - a legend though Chris Gayle remains, it is hard to imagine him turning out for the 2020 event at the age of 40 - which merely reinforces that sense of now or never. Easily it could be other team which would feel home in India. West Indies Vs England today could be the match to watch. Ignominy of 79 all out and losing out by 47 runs. No one could quite believe their eyes, when New Zealand left out Southee, Boult and McClenaghan in the opening game. Other than Milne and Anderson, it was Brendon’s brother Nathan McCullum, Ish Sodhi and MJ Santner, who ? … in the end Santner had 4-0-11-4; while Ish Sodhi had 4-0-18-3. The 4 lefties Shikhar Dhawan, Suresh Raina, Yuvraj, Sir Jadeja and Rohit, Kohli all fell playing tame shots ~ Indian fan disappointed again.